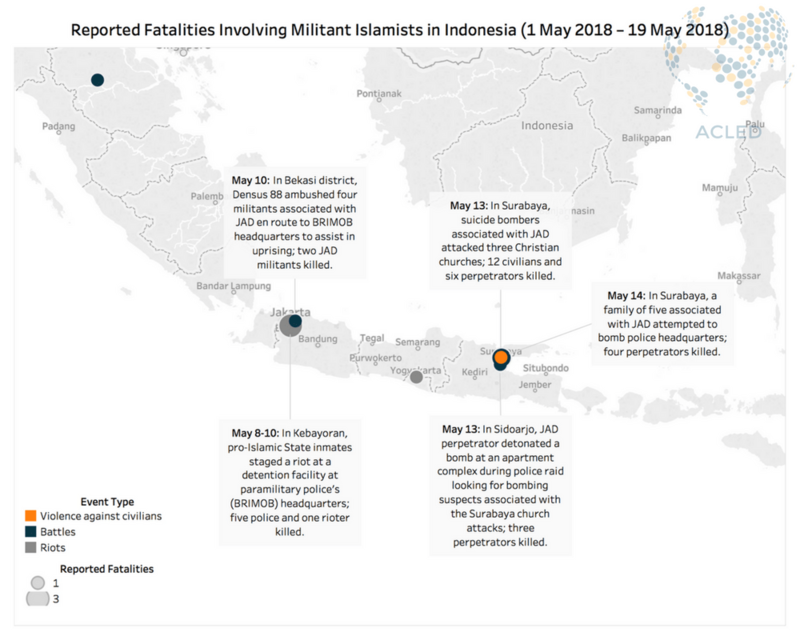 Since May 1, domestic Indonesian Islamist groups that pledged allegiance to the Islamic State (IS) launched several attacks — the first violent acts perpetrated by an IS-affiliated group since the January 2016 attacks in central Jakarta. With Indonesia’s IS supporters no longer traveling to the Middle East since the decline of IS activity in Syria and Iraq, recent attacks by pro-IS groups may signal the resurgence of militant Islamist violence in Indonesia. Even though IS has been on retreat in the Middle East, its brand of Salafist ideology has caught hold of numerous militant Islamist groups in South and Southeast Asian countries — including Indonesia — changing the methods in which these groups operate and the targets that they choose to attack. Both of these tactics push these groups to more closely align with the violent tactics used by IS. In the first ever recorded incident involving IS supporters in Southeast Asia, a woman was used as a suicide bomber (Straits Times, May 14, 2018). Additionally, this month’s attacks have been directed at local targets — Christians and police — as opposed to foreign targets associated with countries that were involved in fighting IS in the Middle East. In a recent string of attacks, at least 38 Indonesians (including 12 civilians) have been reportedly killed by militant Islamists or during government counterterrorism operations (see below). There are various groups in Indonesia that have sworn allegiance to IS. However, when looking at the latest string of violence, it is clear that pro-IS groups in Indonesia are only moderately united. Although the majority of the attacks involved militants associated with Indonesia’s largest pro-IS group, Jemaah Ansharut Daulah (JAD), not all of the violence was committed by JAD members nor was there clear coordination between all the events involving JAD (New York Times, May 22, 2018). The recent string of attacks by militant Islamists in Indonesia offers insight into how IS supporters are reacting to the group’s waning influence in the Middle East. We may expect that the retreat of IS in the Middle East leads to a resurgence of militant Islamist violence in Indonesia, with IS supporters increasing their attacks on civilians and government targets in order to garner more publicity and to bolster recruitment efforts. Paul Swartzendruber is an Asia Researcher with ACLED. He received a BA in French from the University of Texas at Austin, an ALM in International Relations from Harvard University, and an MS in Intelligence Management from the University of Maryland University College. Mr. Swartzendruber has studied and worked in the French language in Europe and West Africa. His research interests lie in counterterrorism issues in Southeast Asia, particularly as they relate to U.S. interests in the region.